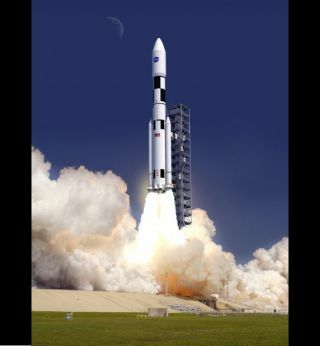 Artist's conception of a Space Launch System (SLS) launch. NASA's Space Launch System will carry humans beyond the grasp of Earth's gravity, stretching to the moon, Mars, and perhaps, one day, deep space. The powerful new launch vehicle is currently under development, and will continue to evolve even after humans take flight. That's because it's based on a modular design of interchangeable parts that allow for varying mission goals and improving technology. The Space Launch System (SLS) comes in an array of elements that will evolve over time, and that will vary depending on whether the vehicle carries crew or cargo. The first few iterations of SLS will contain a pair of solid rocket boosters capped with four RS-25 engines. Most of the engines planned for each launch vehicle are space shuttle veterans, which have undergone rigorous testing. According to NASA, "The RS-25 is one of the most tested large rocket engines in history, with more than 3,000 starts and over a million seconds of total ground test and flight firing time over 135 missions." The four liquid-propellant engines at the base of each rocket, combined with solid rocket boosters, will push the SLS into orbit during its eight-minute climb toward space. Like the engines, the solid propellant boosters were qualified by the space shuttle program, though they've been modified to work with SLS. As technology evolves, the solid rocket boosters will be swapped out for advanced boosters. NASA's Orion crew module will carry human crews into space, though it will fly without the crowd on the first test mission. Drawing from more than half a century of research and development, the Orion module plans to be flexible enough to carry humans to a variety of destinations. The entire craft includes a crew and service module, a spacecraft adaptor to connect it to the powerful rockets beneath, and a new launch abort system that NASA claims "will significantly increase crew safety." Although Orion is relatively new, it has undergone rigorous testing before it will carry anyone off of Earth. The abort system, which will provide the crew with the ability to escape if an emergency occurs on the launch pad, was successfully tested at White Sands Missile Range in New Mexico. An array of tests confirmed Orion's ability to withstand the launch, abort, re-entry and spaceflight itself. The ocean and NASA's Hydro Impact Basin hosted trials that recreated how the module will behave when it splashes down in the ocean at the end of its mission. The capsule itself took a low-orbit test flight in December 2014. Unlike previous human launch systems, SLS is planned to grow and evolve over time. It consists of four configurations that will carry cargo and crew into the darkness of space. This growing capabilities allows engineers to utilize the design today but grow with the future. EM-1: To the moon (and back)! Standing over 322 feet (98 meters) tall, the first Block 1 configuration will carry an uncrewed Orion spacecraft to a stable orbit beyond the moon, then return it safely home. The Exploration Mission-1 (EM-1) will travel 40,000 miles (64,000 km) beyond the moon, a three- to five-day journey that is farther than any astronauts have traveled. The journey will demonstrate the integrated performance of the rocket, the Orion module, and the ground support teams before humans launch. It will be SLS's maiden voyage. The first mission may not carry people, but it won't be traveling empty. When it launches, it will carry more than a dozen CubeSats, small satellites not much bigger than a breadbox but capable of collecting science on their own. "The first SLS launch presents a great opportunity to collaborate with our international partners by providing rides for CubeSats that can pursue independent science and technology missions while supporting our mutual goals for human exploration in deep space," Steve Creech, acting manager of the Spacecraft and Payload Integration and Evolution Office, said in a statement. The mission is scheduled to launch in 2018. The second mission, Exploration Mission-2 (EM-2) will host a similar configuration to EM-1. This time, however, the Orion capsule won't be empty. Instead, it will carry several astronauts into the region of space past the moon to the region explored by the previous mission, and is targeted for a 2021 timeframe, though some reports suggest it may have to wait until 2023. The June 28, 2016 booster engine test for NASA’s Space Launch System (SLS) rocket was a success! The second and final qualification motor (QM-2) was set ablaze outside Orbital ATK's test facilities in Promontory, Utah. The next set of missions require the Block 1B configuration. The Block-1B version of SLS will be approximately 364 feet (111 m) tall, towering above the historic Saturn V rocket that carried astronauts to the moon. In addition to carrying the Orion module, the Block 1B can carry with it exploration systems such as a small deep-space habitat module. "The second configuration of SLS, known as Block 1B, will be the workhorse of the proving ground phase of NASA's journey to Mars," Creech said. "The rocket will carry crew and exploration systems tens of thousands of miles beyond the moon to demonstrate new capabilities that will enable us to then move outward toward the Red Planet." Or the module can be swapped out for a payload configuration that can carry larger exploration systems or science spacecraft instead of people. "While many people think of the Space Launch System in terms of human exploration, SLS could have a wide application in a lot of other areas, including space science," Creech said. "For missions to the outer planets, for example, SLS could make it possible to do things that are currently impossible, such as sending larger scientific spacecraft with more instruments to far off destinations with reduced transit times." That could include helping the proposed mission to Jupiter's icy moon Europa. According to NASA, the transit time for the Europa Clippercould be reduced to less than half needed by other launch vehicles. "The potential use of SLS for science will further enhance the synergy between scientific exploration and human exploration," John Grunsfeld, astronaut and former associate administrator for science at NASA Headquarters in Washington, said in a statement. "SLS has the promise of enabling transformational science in our exploration of the solar system and cosmos." NASA's giant Space Launch System, or SLS, is derived from proven technology used for decades in America's moon program and the space shuttle. See how NASA's Space Launch System mega-rocket works in this Space.com infographic. Only after astronauts have performed several deep space missions to the moon will NASA consider utilizing the Block 2 as the primary transport for a human mission to Mars. The most advanced SLS configuration will tower above its predecessors at a whopping 365 feet in height. "The Space Launch System could be really game-changing for space science," said Reggie Alexander, manager of NASA's Advanced Concepts Office. "For some missions, it makes it much easier and quicker to carry them out. A Mars sample return mission, for example, could be flown using only one rocket instead of three. But for other destinations, SLS lets you do things we could only dream of before — like collecting samples from the geysers of Saturn's moon Enceladus." The various components of the SLS Block 1 are still being tested before the 2018 launch. As of yet, only the uncrewed and crewed missions to the outer edges of the moon and back have received funding, making the timeline of subsequent stages hard to pin down. "We have come a long way since the beginning of this program in 2011," SLS Program Manager John Honeycutt said in a statement. "I am confident that this vehicle has the capabilities to take us on human exploration missions that have never been accomplished before, and it's exciting for me, and our workforce, to be a part of that story."